Stob Coire Sputan Dearg offers 2 distinct areas for skiing: the cliffs of Coire Sputan Dearg, and the main face below the summit. Coire Sputan Dearg offers some short gullies that hold snow well after a thaw, despite their South-Easterly aspect. It's quite feasible to do several runs in a day here. Below the summit of Stob Coire Sputan Dearg, there is a big face that holds snow well. It offers a number of less well defined descent options, that will all depend upon getting a balance between a low enough snow line, and a manageable cornice. The best approach is from the Linn of Dee, preferably with a bike. You can cycle to Derry Lodge on land rover track, and then it's possible to cycle beyond that to the fence at Luibeg. From there, follow a narrow path on the East side of the Luibeg Burn and then heather bash into Coire Sputan Dearg. There is a faint path, but it is difficult to find and easily lost. Alternatively, you can ascend Sron Riach, which may be preferable if you are planning to do some of the bigger lines on the main face. There are 2 Scottish Avalanche Information Service forecasts worth considering for Ben Macdui: Stob Coire Sputan Dearg. Main Spout is the wide corridor at the Northern end of the cliffs of Sputan Dearg. It is very wide compared to the other gullies here, and isn't recessed enough to maintain a depth of snow after a thaw. The lower section can be a wide grassy scree slope when the other gullies are full of snow. Not steep enough for Grade I, it is the easiest of the gullies here. There is a small rocky knoll on the Northern side of the gully mouth, offering a good vantage point to view the descent. Most of Narrow Gully would be classed as easy Grade I, but the top 15m is very steep, and may be bare of snow in the spring. 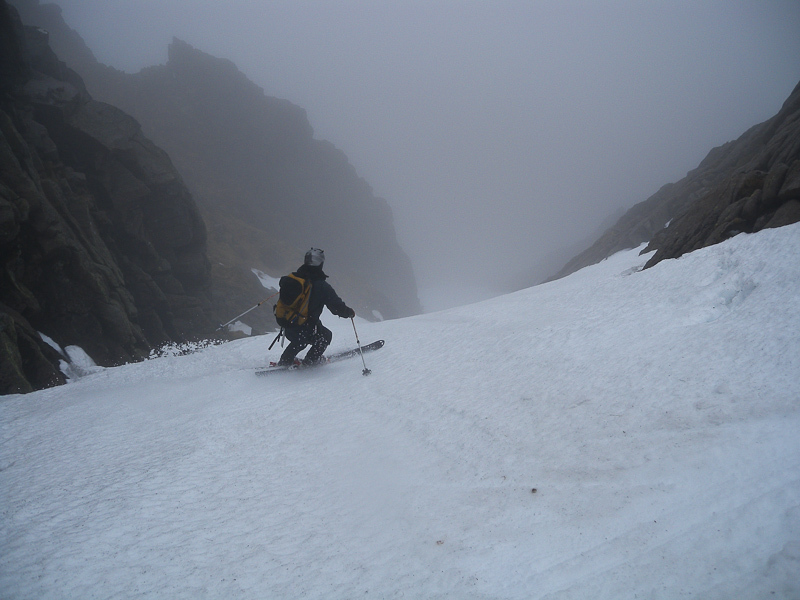 If bare of snow, you can down-climb a grotty gully to reach the start of the snow. Below this point, the gully is a comparable angle to Glissade Gully, and is quite an easy ski. In "full" conditions, such as those found in winter 2010, the gully can fill up and become a shallow depression, rather than a defined gully. Notes: Top 15m possibly too steep to ski, then easy Grade I below. This is the easy angled gully in the centre of the cliff. It's not steep enough for Grade I, but offers a fine uncomplicated line into the corrie. It is useful as a warm up for the steeper lines, and to be used as a quick means of returning to the corrie rim. Anchor Gully is named due to the shape of the snow that forms beneath it in the spring. The name "Hourglass Gully" would be equally appropriate, due to the shape of the gully, with an obvious constriction at the mid-point. The gully is consistently steep throughout, and at the narrow point, you may only have a few centimetres of snow either end of your skis. When a cornice is present, a way through can often be found on skiers left. This line lies on the southern side of Pinnacle Buttress. It's a smooth ramp, rather than a gully, bounded on skiers left by the rock wall of Pinnacle Buttress. The entry is quite steep, and a little intimidating. Assuming no cornice and good visibility, once over the edge, it's fine. Alternatively, it looks feasible, albeit quite steep and exposed, to head skiers right from a small nose which forms the boundary between the ramp line, and the shallow gully (which also looks like a good line). If you were to take this approach, you can cut back into the ramp line below a tongue of rock. This line is marked on the main photo by a dashed line. The main face of Stob Coire Sputan Dearg is split into 2 distinct sections. The face directly above Lochan Uaine leading to the summit is very steep at the top, often ringed by prohibitive cornices. There's a handy rocky outcrop at the summit that juts out slightly, allowing an airy view of the slope below. It's characterised by horizontal bands of bare ground when conditions are lean, and doesn't look like it would be a rewarding ski. However, to the North of the summit, there's a noticeable change in angle of the slope. It can still be topped by a considerable cornice, but you may find a way through if you are prepared to traverse in a little from the North. Pick your entry, and aim for the blunt ridge above the lochan. Your descent from there will be determined by snowcover, but a short gully may offer a steep little entry to the slope above the lochan. For the apparent size of the face when viewed from the Luibeg Burn, the skiing seems disappointingly brief. However, if there is enough snow, the continuation down the outflow of the Lochan can give a pleasant extension to your ski. Notes: Steep enough at the very top to be Grade I, but the angle eases almost immediately.